Although I live by myself, every day I fall asleep and wake up to the sounds of scurrying, scampering and scratching. Sometimes, there's squeaking, too. This morning, there was the unmistakable sound of something round and dense being dropped, picked up and dropped again. All this activity is happening over my head in my top floor apartment. There's a gang of raccoons living in the attic above me. How do I know they are raccoons and not squirrels, mice or rats? For one thing, if you heard how much noise these animals make when they are moving around, you'd know there's something much bigger than a squirrel (these guys are very heavy from a diet of urban scraps). More convincingly, my landlord told me about the time a raccoon got into the apartment through the trap door in my closet. 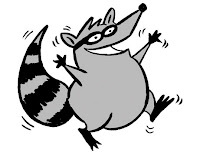 Apparently he (the raccoon, not the landlord) trashed the place and had to be caught by animal services. I know the raccoons are vermin but I like that they are there right above me, safely separated. The noise never bothers me: it makes me smile to hear them clamoring around above my ceiling, always so busy. You're never lonesome with a roof full of raccoons. Racoons in the belfry? I think not. at least not for me - I'd want them outta there. Hey - do you read your email? I sent you something to your gmail account re: selling photos and a calligraphy question, and never got a reply. It's ok if you don't want to reply - but it'd be nice to know if you at least got it. Maybe you have too many fans to reply to them all - wouldn't that be nice! Either way - keep posting and take care.